The Annual Fund is The Bay School’s primary fundraising focus. Each year, every Bay family is asked to make a gift to the Annual Fund. Because tuition represents approximately 92 percent of the program costs required to educate Bay students, gifts to this yearly appeal supplement Bay’s operating budget, supporting Bay’s exceptional educational and exploratory programs, faculty, and students. Each fall, all Bay families are contacted by Bay's parent volunteers. Gifts to the Annual Fund have ranged from $10 to $100,000. 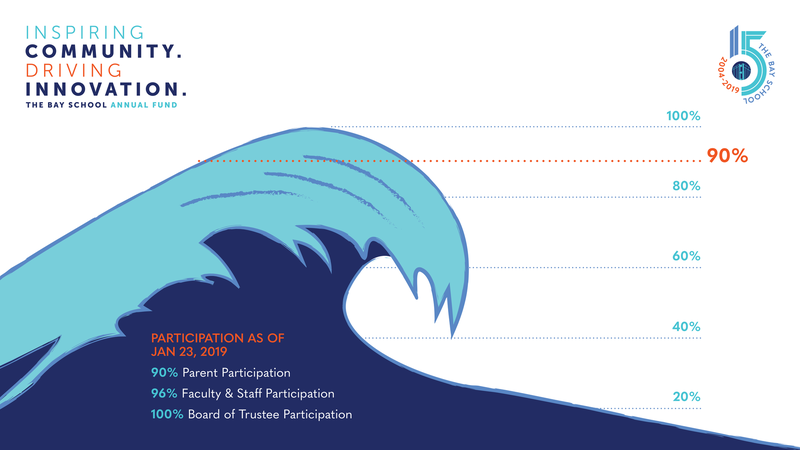 We ask that Bay families make The Bay School Annual Fund a philanthropic priority, and we seek to have 100% participation every year from our Board of Trustees, staffulty, and parents. Every gift makes an impact, supporting exceptional teaching and learning in the academic year it is given. Whole-community participation in the Annual Fund sustains and elevates the dynamic culture that defines Bay, providing equitable and inclusive opportunities for all Bay students. For more information, please see Bay's Annual Fund FAQs. For more information or questions about giving, please do not hesitate to contact Charlie Meade, Director of Advancement at cmeade@bayschoolsf.org or 415-561-5800, ext. 102.